(June 2012) – The decision to extend the life of one of the largest copper concentrate and gold mines in Papua New Guinea has resulted in a significant fleet upgrade, with 25 new250-tonne dump trucks put to work carting copper ore from the mine to the crusher. prolong the lifespan of this new fleet, the Keech Keeplate has been chosen to line the dump trucks trays. Keeplate is manufactured from chromium carbide beading welded onto a 250 grade steel base and is available in a range of thicknesses. Keech Australia’s Michael Scott, who works directly with a number of mines in Papua New Guinea, said the installation of the Keech Keeplate significantly increases the lifespan of the trays, buckets and blades of mines equipment it is used on. Other applications for the Keech Keeplate include dozer mouldboards, shovel and loader buckets, skid plates and high speed chutes. When it came to choosing the most appropriate thickness for truck tray liners, consideration was given to overall weight of the liner-plates along with the impact conditions. “You don’t want to add too much weight to the tray, particularly when the trucks are used for downhill loads. “At the same time, you want the plates to be thick enough to provide maximum protection, so it’s a matter of balancing these two issues to find the right Keeplate for the job,” explained Michael. Keech’s WearpactTM system, a patented ground engaging tool designed for underground loader buckets, is also proving popular in Papua New Guinea, Michael added. Manufactured from Keech Australia’s own high impact and wear resistant steel, WearpactTM features multiple retentions to prevent the castings from coming loose. Ease of installation and removal is ensured thanks to the hammerless easy wedge retainer. “The WearpactTM system is designed for full bucket nose protection and a clean upper lip plane finish. There is no intrusive casting inside the bucket to hinder loading or dumping operations. The system also provides the option of moving from semi-spade to full-spade by simply changing the castings,” said Michael. 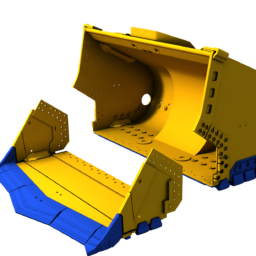 “It’s been manufactured to wear from the bottom up, which gives a greater wear away to throw away ratio, thereby reducing the overall cost for the mining operator. “We’re currently fitting the system to a fleet of underground loaders buckets in a large copper and gold mine in the highlands region of Papua New Guinea following a successful trial of the system on underground loaders,” said Michael. Michael added that with the mining boom continuing across Papua New Guinea, he expects further interest in the range of Keech products in the coming months.